Venida Browder in January. Image via Getty. In 2010, Kalief Browder, then 16, was accused of stealing a backpack, a claim he adamantly denied. After being charged with robbery, grand larceny and assault, he was taken to Rikers and held on $3000 bail. Because his family could not afford it, and because of the labyrinthine nature of the Bronx courts, Kalief Browder was imprisoned for three years, most of it in solitary, before his case was dismissed. He told the New Yorker in an October 6, 2014 issue, “Being home is way better than being in jail. 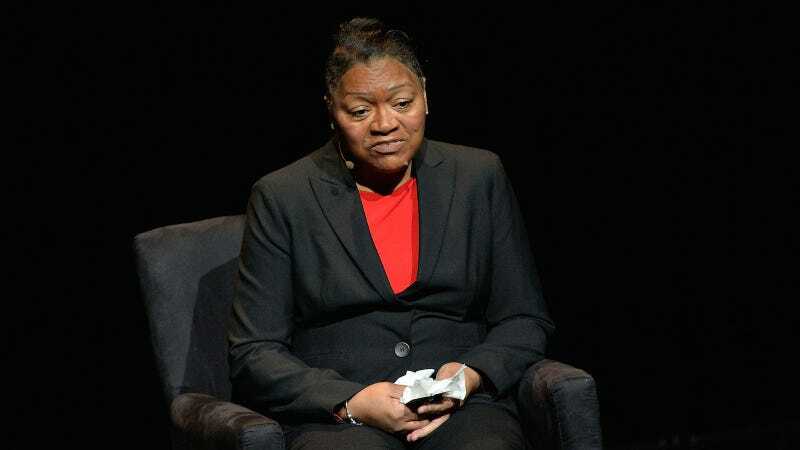 But in my mind right now I feel like I’m still in jail, because I’m still feeling the side effects from what happened in there.” In June of 2015, Kalief Browder, then 22, hung himself. In January, Spike TV will air a six-part documentary on Kalief Browder, produced by Jay Z. Just last week, Venida sat with Jay during a press conference about the series. Below, via VIBE, Jay introduces her and she speaks about Stop Solitary for Kids, a campaign to end youth solitary confinement.